The City of London is amending the Official Plan and Zoning By-law to implement recommendations of the Hamilton Road Community Improvement Plan. The City of London, City Planning is amending the Official Plan and Zoning By-law to implement recommendations of the Hamilton Road Community Improvement Plan (CIP) to support local businesses and the development of a vibrant, healthy and mixed-use area along the Hamilton Road Corridor. To do this, we need to amend the Official Plan and the Zoning By-law to allow these changes to happen. What do we want to achieve through this project? Continue to enhance the vibrancy of the Hamilton Road Corridor and support the development of a healthy and mixed-use area. Support the local community and success of local organizations and businesses. Allow more flexibility for businesses along the Hamilton Road Corridor by providing a greater range of permitted uses. Identify additional parking opportunities for local businesses, customers and visitors. Increase the interest and investment from the private-sector. Identify areas and sites that may be redeveloped in the future. What is the status of the Hamilton Road Community CIP? Approved by Municipal Council in 2018. What is the community’s role? Get involved in the discussions, attend the Community Meetings, and participate in the community consultation opportunities! We’d like to hear from you and learn from your experience. What is City Planning Staff’s role? Consult with residents, business owners, and anyone else who is interested in the future of the Hamilton Road Corridor and get feedback. Consult with City Divisions and Agencies. Review planning policies, projects, legislation. Conduct on-site research and analyze the area. 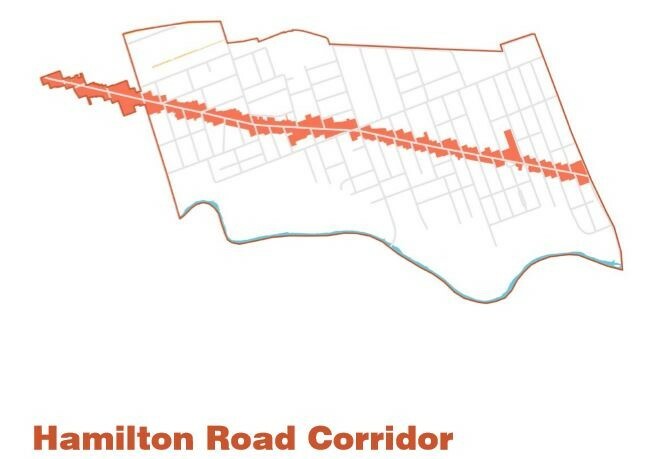 Make recommendations to Council to change the 1989 Official Plan policies for the area to make them consistent with The London Plan (Council-adopted new Official Plan) policies for the Hamilton Road Corridor. Make recommendations to City Council to change the Zoning By-law to allow the knowledge gained from this study to be implemented. What is City Council’s role? Consider the recommendations from City Planning Staff and the feedback from project participants and make decisions about the future Official Plan policies and Zoning By-law permissions for the Hamilton Road Corridor. Note: The Study Area will be refined as the project progresses. What uses would you like to see in the Hamilton Road Corridor? What is not allowed that should be allowed? Why? Are there certain areas where certain uses may be better than in other areas? Are there any uses that are allowed now that should not be allowed in the future? What are they? Which properties could be combined to make larger sites? Join the conversation today. Sign up or login to share your thoughts and ideas. Please note your response will be shown publicly. Please note your screen name will be shown publicly. Where do you think parking could go? Is there any cost to property owners in the Study Area of this project? Will property owners have to decide on the zoning that they want? No. City Planning Staff will ask for ideas about the types of uses that people want to see in the Hamilton Road Corridor. This will help City Planning Staff make recommendations. The draft recommendations will be presented to the community for review and feedback before being considered by City Council. Will my property taxes change? Your tax bill is calculated using the assessed value of your property and the Municipal Tax Rate for the overall land use of your property. Will my property value change? The Municipal Property Assessment Corporation (MPAC) determines the value of your property.Your property value is shown on a property assessment notice from MPAC and on your annual property tax bill. Property values are reassessed every 4 years. In 2016, MPAC reassessed properties across Ontario and these assessed values apply from 2017 to 2020.If the value of the overall area increases, it is likely that your property value will also increase. What about people who have started a re-zoning process for their property? This project will not affect rezoning files currently underway. I want to rezone my property. Should I wait for this project? This is up to each individual property owner.If a property owner has a defined timeframe and wants to complete a rezoning in 2019, they may want to proceed. How much does a rezoning cost? $11,000 Application Fee plus the cost of necessary studies and other submission materials (e.g. Traffic Study, Site Plan). This study will look at changing the zoning at no cost to property owners.